In 1946, Frank A. Duca, Sr. and Jack S. Cammarata formed a partnership known as the Cammarata & Duca Funeral Home. They were both born in Johnstown, Pennsylvania, a small town of immigrant steel workers and trained craftsmen and strong ethnic heritage. Both were graduates of Johnstown High School, veterans of World War II and diplomates of The American Academy of Embalming, New York, where Frank Duca was at the top of the graduating class of 1938. After graduation, with help from family and friends, they purchased an estate from the well known Cover family, located at the corner of Locust and Jackson Streets in downtown Johnstown. The Downtown Chapel withstood the great floods 1936 and 1977. The building is located one block from St. John Gualbert Cathedral and two blocks from Central Park. The downtown chapel closed its doors in 2010. In 1975, Frank A. Duca, Jr., graduated from Westmont Hilltop High School. He attended the University of Pittsburgh and in 1978 he graduated from Pittsburgh Institute of Mortuary Science. Frank Jr. served his internship under his father. Frank Sr. passed away on February 8, 1981, and Mr. Cammarata retired shortly thereafter. Frank Jr. then founded the Frank Duca Funeral Home. In June, 1984, major expansion work was completed and the Westmont Chapel was opened for business. The building is located next to the former Stutzmen School at the intersection of Menoher Blvd. and Goucher Streets. This occurred during a period of rapid growth in the Johnstown area. Business grew quickly by serving all races, religious and ethnic groups. 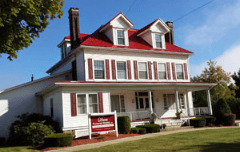 The incorporation of the Frank Duca Funeral Home was competed on January 1, 1996. Thirty-one years later, in July 2015, we opened our the East Hills Chapel, located at 404 Walters Avenue in Geistown (near the PA Drivers Center) to better serve the East Hills community. At this facility we now offer cremations at our own ON-SITE Crematory. Your loved one never leaves our facility for the entire cremation process. The Frank Duca Funeral Home invites schools, civic groups and church organizations to tour the facility. We discuss Pre-need and Aftercare programs. We are currently coordinating a Death & Dying library. There is a growing interest and need for people to have access to books and reference books regarding death and the dealing with death by the loved ones who survive and mourn. The library will contain books to help explain situations to children to help them come to terms with and understand death in a manner appropriate for their age groups. This is just one example of how we are working to support our community and provide information and fellowship with our friends in the community. We also speak to organizations to discuss any part of our business and procedures to meet the needs and interest of the group. We assist with monument purchases, cemetery lots and offer many suggestions as to the immediate needs as occurs. The Frank Duca Funeral Home has been dedicated to personal and compassionate service to our families in the community and will continue to do so for generations to come.